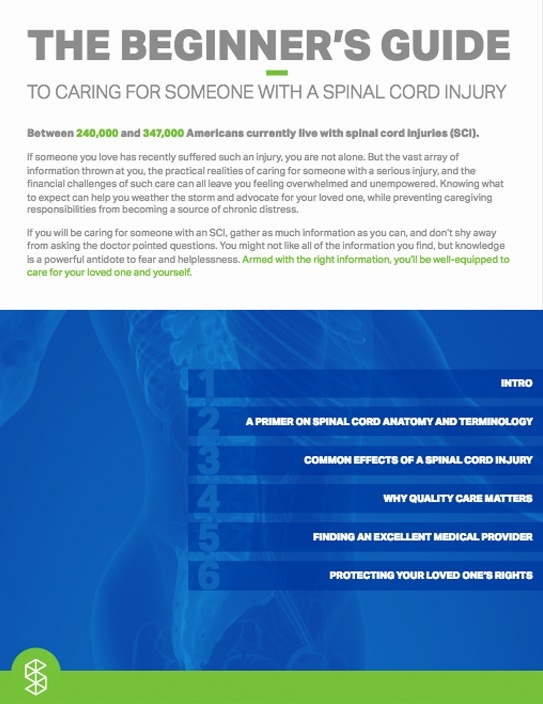 Between 240,000 and 347,000 Americans currently live with spinal cord injuries (SCI) but no one ever plans for or expects it to happen to them or someone they love. Knowing what to expect can help you weather the storm and advocate for your loved one, while preventing caregiving responsibilities from becoming a source of chronic distress. If you will be caring for someone with a spinal cord injury, gather as much information as you can, and don't shy away from asking the doctor pointed questions. This simplified guide will walk you through critical things you should know and consider when caring for someone that has recently experienced a traumatic injury. Download the guide by filling out the form to the right and you will be empowered to start educating yourself on the basics of caring for someone SCI.